The Cathedral Square used to the yard belonging to the medieval Bishop’s Palace. East of the cathedral, the diocese’s chapter archive can be found. It was built in 1780 by Johann Kramer, an architect from Augsburg who settled in Pécs. The crypt for the diocese and the cathedral chapter is located beneath the chapter archive. Its wrought-iron gate is one of the most beautiful rococo artefacts in Pécs. West of the cathedral, the bishop’s residence adjoins the square. The façade , as it can be seen today, was created around 1870. 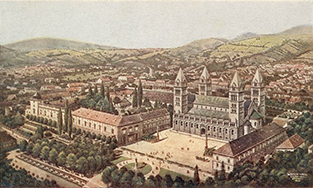 It was constructed by Johannes Baldauf, an architect from Tyrol, who married the daughter of a Pécs German bourgeoisie family and opened an office there. A statue of the great composer and piano virtuoso Franz Liszt can be found in the southern corner of the palace. The musician had stayed in Pécs as the Bishop’s guest for several days in 1846. On the square’s southern side, a statue of Bishop Ignác Szepesy was erected in 1891 – as the first public monument in Pécs. It was created by György Zala, a painter who had already worked on ornamenting the cathedral. Szepesy was one of the founders of the judicial lyceum in 1830 and further was responsible for the establishment of a printer’s shop for which he brought sample letters, other instruments and a master printer to Pécs from Vienna. Cathedral Square in the early 20th century.